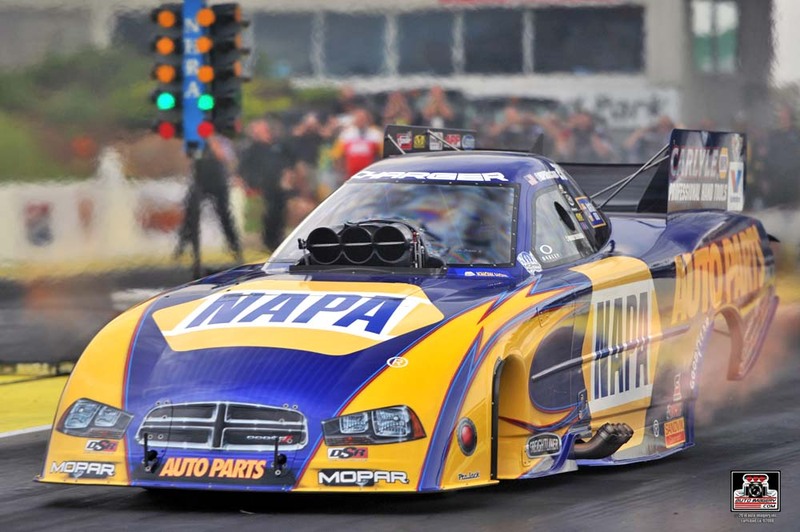 TOPEKA, Kan. (May 25, 2014) – Sooner or later it’s bound to happen, and Ron Capps hopes it’s a lot sooner. The driver of the NAPA AUTO PARTS Dodge Charger R/T Funny Car has not visited the winner’s circle or advanced to a championship round at an NHRA Mello Yello Drag Racing Series event since last year’s event at Brainerd, Minn., a stretch of 15 events. 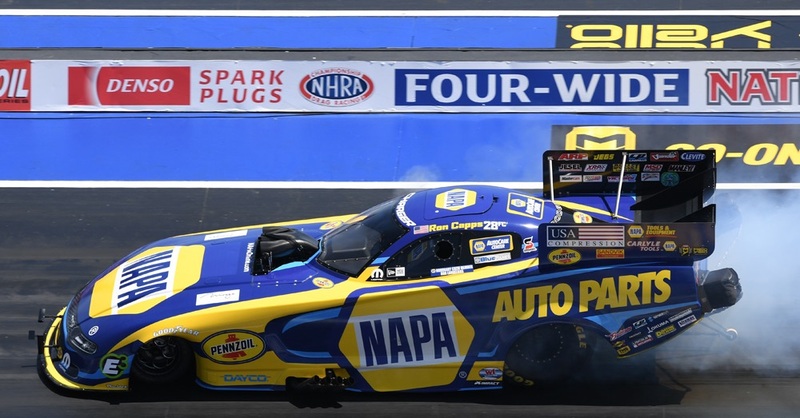 Ron looked like his streak could end Sunday at the NHRA Kansas Nationals at Heartland Park Topeka but for the third straight event and fifth time in the past six his NAPA Dodge led by crew chief Rahn Tobler could not get past the semifinals. 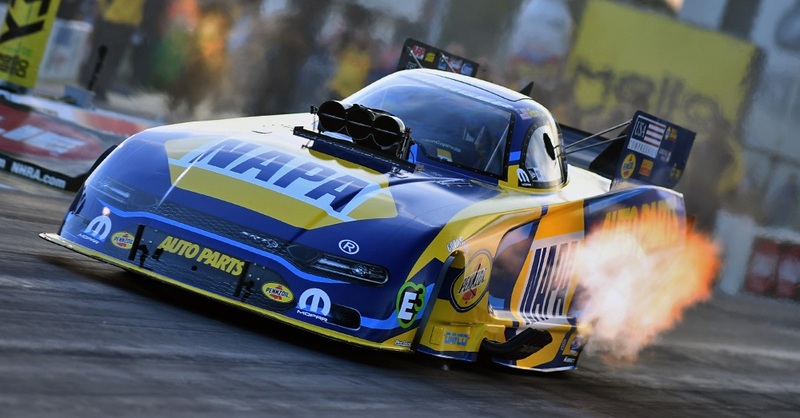 While the popular driver from Southern California is eager to collect the 42nd Wally trophy of his career, the team’s consistency has enabled the NAPA team to hold the fourth spot in the championship standings. “Streaks like we’re having of getting to the semifinals means we’re gaining points and we’re gearing up to try and win a championship at the end of the year,” said Ron, who has won three times – including twice with Don Schumacher Racing – in five championship rounds at Topeka. 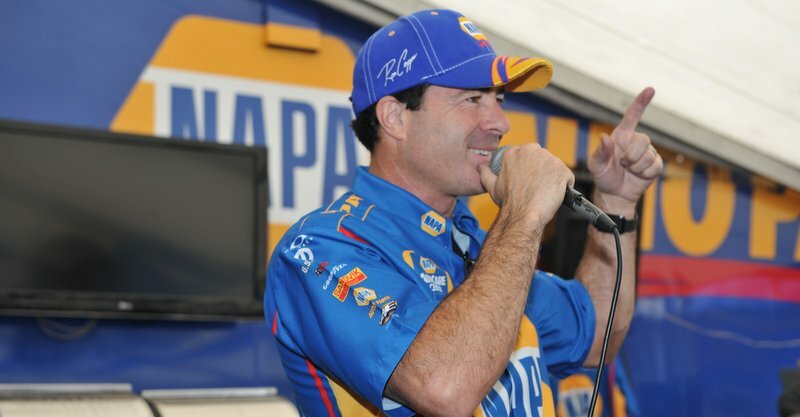 “This is another weekend where it paid off to have a crew chief like Rahn Tobler who has that NAPA Know How. 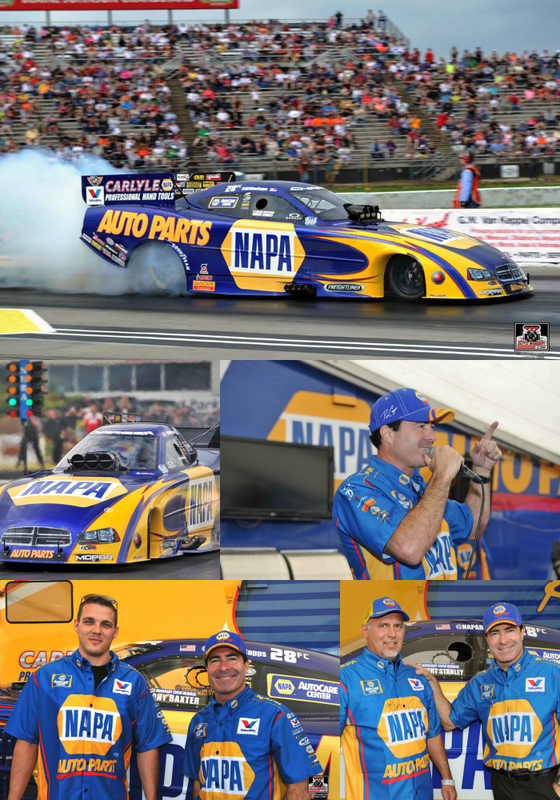 Tobler and the NAPA crew guys have it. We were thrown adverse conditions all weekend with rain coming and going then the sun comes out on race day. I don’t think people realize what it takes to get the car ready and the changes you have to make as a crew chief. 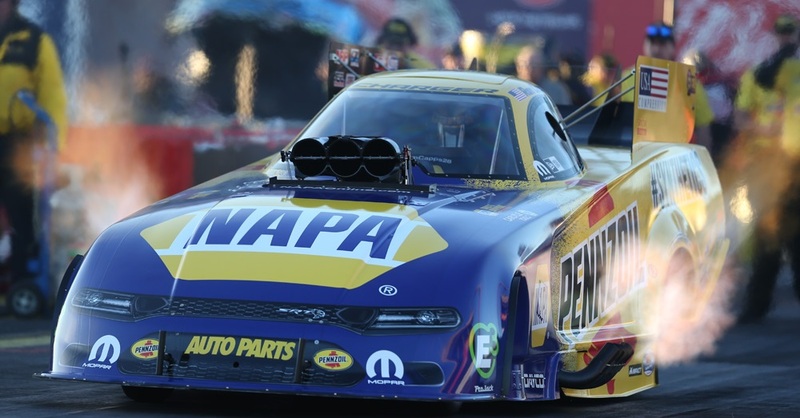 DSR and the Mello Yello Series head east and begin racing Friday at Englishtown, N.J., to conclude a stretch of three events in three weeks. 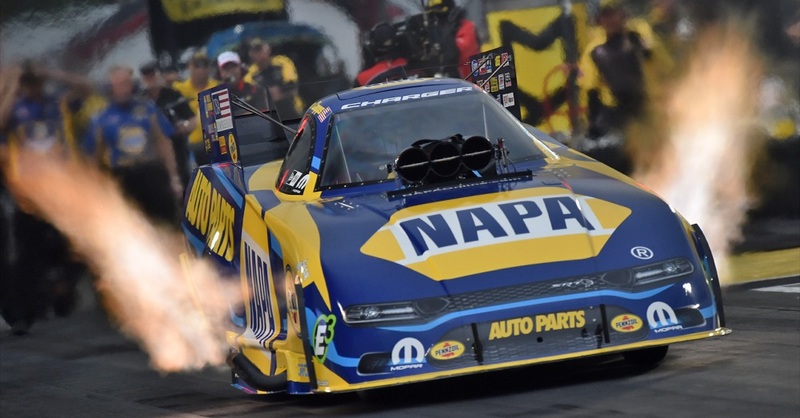 After a one-week break, teams embark on four races in four weeks with the first on June 13-15 at Bristol, Tenn.
“I love these swings with one race after another and I think we gain an advantage with our NAPA team,” Ron said. 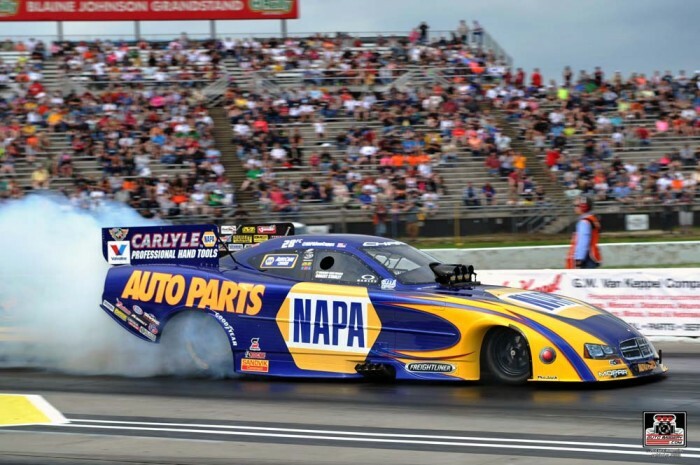 “We’re very close to a win, and we’re going to Englishtown where we made the run (3.964 seconds on May 31, 2012) that still stands as the quickest ever in a Funny Car. The following are Capps’ results and other event notes for the NHRA Kansas Nationals. Ron Capps with Honorary Pit Crew Members Tony Baxter and Rob Stanley.